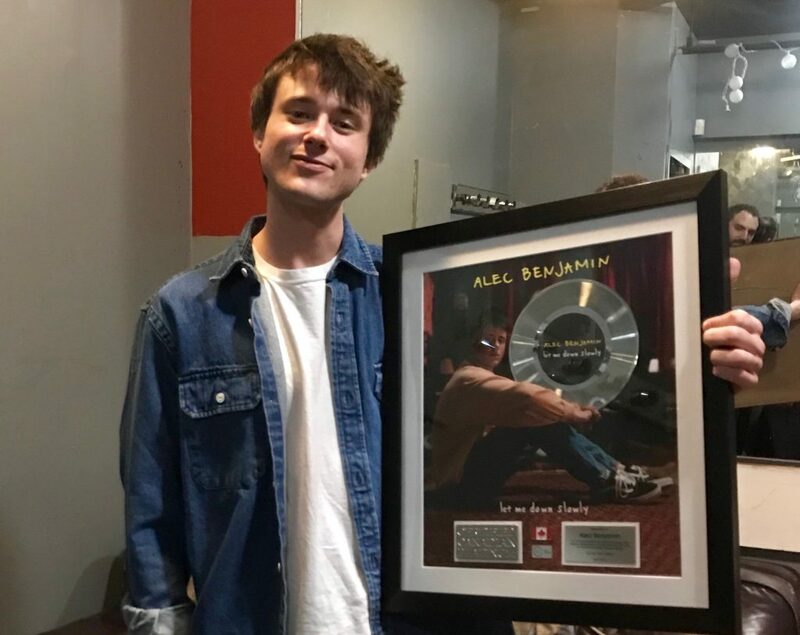 During his 2019 Outrunning Karma North American tour, American singer-songwriter Alec Benjamin stopped in Toronto over the weekend for a show at The Mod Club. 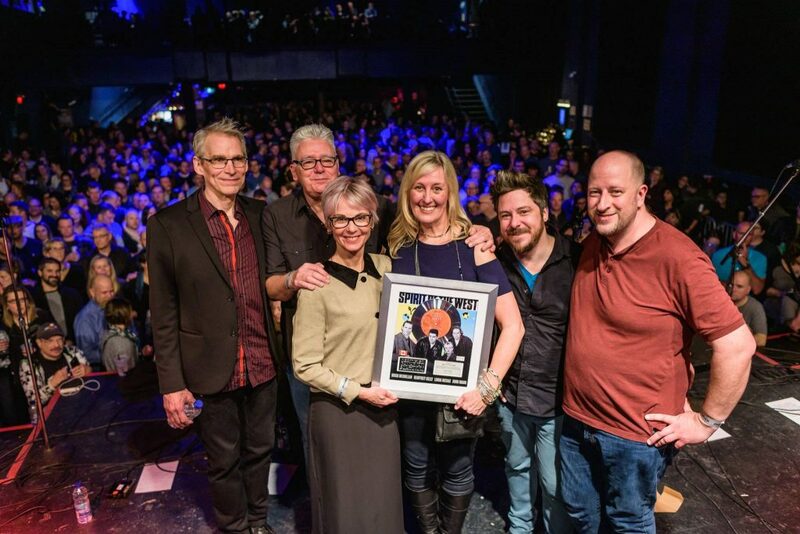 Prior to his set, Warner Music Canada presented Benjamin with his first Platinum award plaque for his hit “Let Me Down Slowly,” which was first certified Gold in Canada in December of 2018. Benjamin will play Montreal tonight at Le ministere before hitting the west coast next month for a show at St. James Hall in Vancouver on May 2. The music video for “Let Me Down Slowly” can be viewed below. Earlier this week, American pop group Why Don’t We played their biggest Canadian shows to date, stopping at Laval, QC’s Place Bell and Toronto, ON’s Coca-Cola Coliseum as part of their 2019 North American tour. 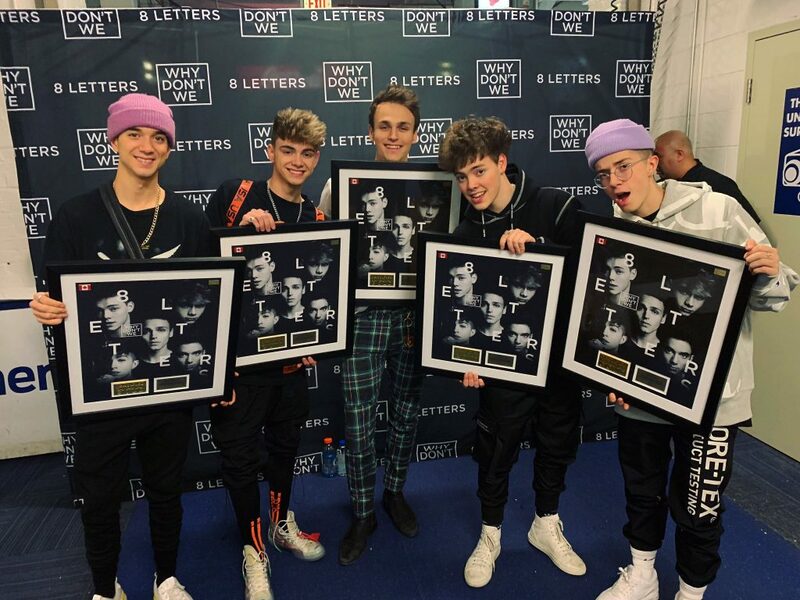 Ahead of Tuesday’s sold-out show in Toronto, Warner Music Canada surprised WDW with their first ever award plaques for any territory, commemorating the Canadian Gold certification of the their single “8 Letters,” the title track of their 2018 debut album. Fans across the globe celebrated with the band on social media, whose members include Daniel Seavey, Zach Herron, Corbyn Besson, Jonah Marais, and Jack Avery. Watch the music video for “8 Letters” below. Following the presentation, Helman joined his fans in the front row for a picture with the plaque, and you can watch how it all went down below. In 2015, Helman received his first Gold plaque for “Bungalow,” which was later certified Platinum in 2016. In 2018, “PDA” from his 2017 album Hotel de Ville become his second Gold-certified track. Watch the video “Hang Ups” below. “With You” is now Canadian singer-songwriter @TylerShawMusic‘s fourth single to be officially certified #GoldinCanada! During the JUNOS broadcast, Shaw performed the hit single, and you catch watch this performance below. 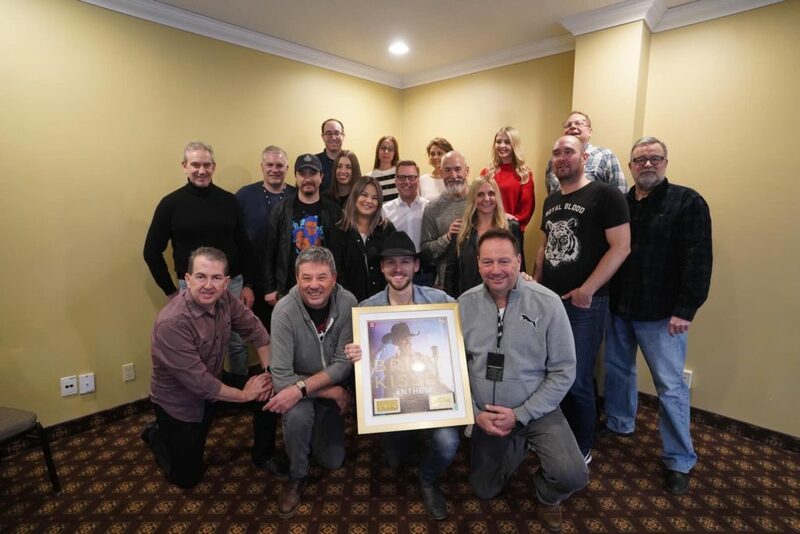 Brett Kissel with his Warner Music Canada team on Friday, March 15, 2019 in London. The 2019 JUNO Awards are officially in the books, and country artist Brett Kissel walked away from the festivities in London, ON with some new hardware in hand. 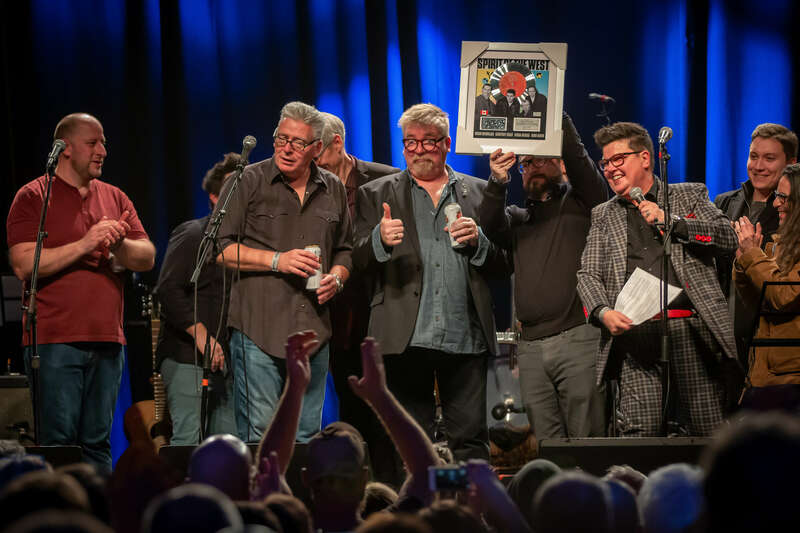 To kick the weekend off, Kissel was presented with a custom Gold plaque for his hit “Anthem” by his Warner Music Canada team, as well as a CIMA Road Gold plaque commemorating his cross-Canada ticket sales. Check out the video for “Anthem” below. On Friday, March 1, Toronto musician grandson performed his biggest hometown show to date at The Opera House to wrap up the Canadian leg of his 2019 “No Apologies” North American headlining tour. 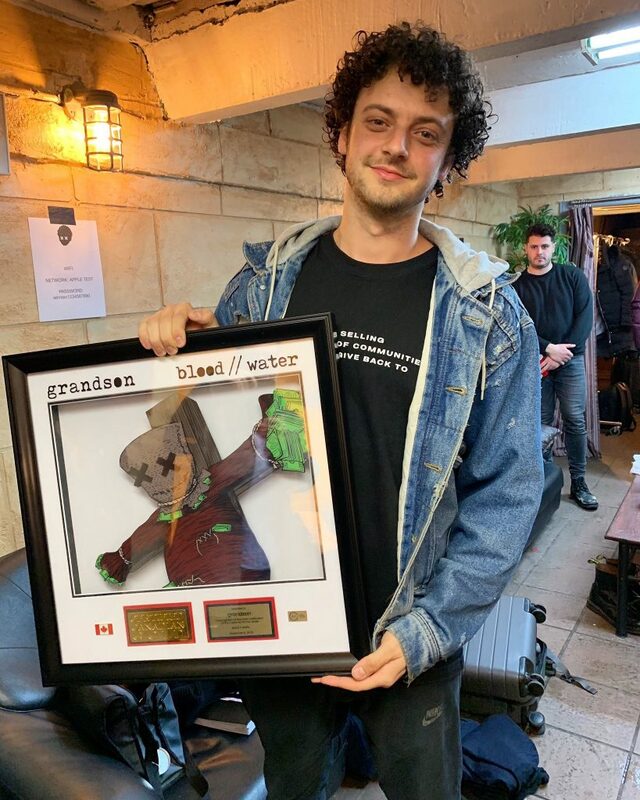 Prior to his highly anticipated performance, Warner Music Canada surprised the 2019 JUNO Breakthrough Artist of the Year nominee with a Gold Single Award for his breakout hit “Blood//Water,” which is featured on his debut 2018 EP a modern tragedy vol. 1.
less than a year later we sold out almost 1000.
tonight will be an unbelievable night for the grandkids and I hope you feel personally responsible for this in some way because you are. we can’t be turned down any longer. The music video for “Blood//Water” can be viewed below. 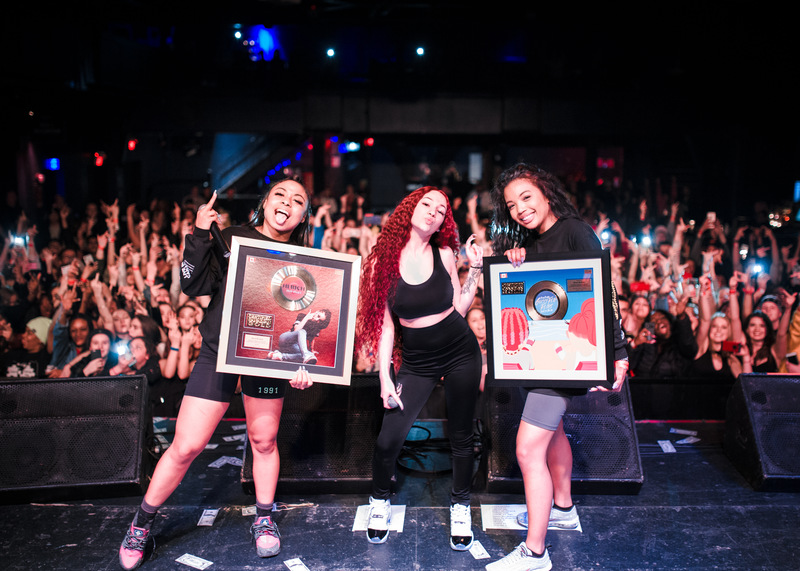 On Sunday night, Danielle Bregoli – AKA Bhad Bhabie – packed Toronto’s Phoenix Concert Theatre for the second stop on her 2019 Canadian tour. Following her high energy set, the 15 year-old viral rapper was brought back on stage and surprised with two Canadian Gold Single Award plaques for her hits “Gucci Flip Flops” and “Hi Bich” in front of her adoring fanbase. Bhad Bhabie’s Canadian tour continues to head west before wrapping up Saturday night at Vancouver’s Venue. Watch the video for “Gucci Flip Flops (ft. Lil Yachty)” below. Following a monumental year in 2017, Music Canada’s historic Gold/Platinum Canada program continued to experience spectacular growth in 2018 thanks to the inclusion of streaming for both Single and Album Award certifications, as well as a simplified application portal for certification approvals and plaque orders. 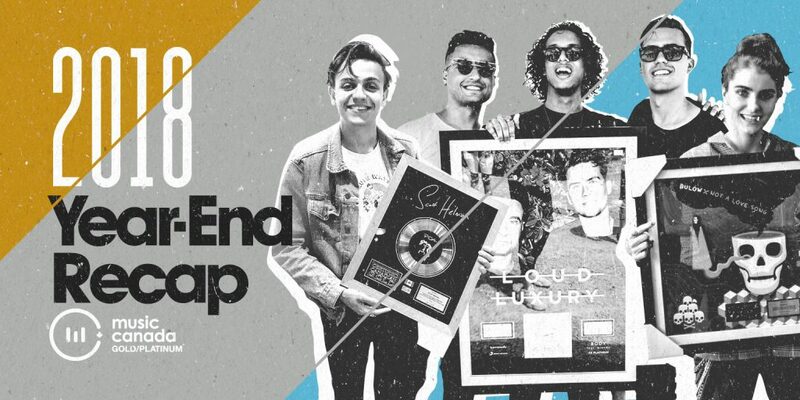 With the new guidelines firmly in place by the start of the year, Single Award certifications increased a total of 33% from 2017’s total, with a 38% increase in tracks receiving their first Canadian Gold certifications. Seven singles received Diamond certifications, matching the number from 2017. UK singer-songwriter Ed Sheeran received two Diamond certifications for “Perfect” and “Thinking Out Loud,” the latter featured on Sheeran’s 2014 album X, certified 8x Platinum in 2018. Toronto-born rapper Drake received the highest certification in 2018 for a Canadian artist with the 8x Platinum certification of “God’s Plan,” followed by breakout DJ duo Loud Luxury with their 7x Platinum summer hit “Body.” “God’s Plan” is featured on Drake’s Double Platinum album Scorpion, which is also the highest certified Canadian album released in 2018. Shawn Mendes received the second highest certification for a 2018-released Canadian album for his Platinum-certified self-titled release. In total, Music Canada experienced a 24% increase in album certifications, and a 10% increase in Canadian album certifications. UK singer-songwriter Adele received the highest album certification of 2018 at Double Diamond for her 2011 sophomore effort 21, which was the first Double Diamond certification since Shania Twain‘s Up! in 2004. American rapper Post Malone received the highest certification for an album released in 2018 with his 4x Platinum sophomore effort beerbongs & bentleys, which features 9x Platinum single “Rockstar (ft. 21 Savage).” Hard rock group Three Days Grace received the highest album certification for a Canadian artist with their 2006 album One-X. There was also an 80% increase in Single Award certifications from Canadian artists, with several Canadian artists receiving their first Single Award certifications including Baka Not Nice, bülow, Charlotte Cardin, Delaney Jane, Elijah Woods x Jamie Fine, Felix Cartal, Grandtheft, Half Moon Run, Keys N Krates, Killy, Loud Luxury, Majid Jordan, NEW CITY, Sultan + Shepard, The Glorious Sons, and The Reklaws. All singles receiving their first #GoldinCanada certifications in 2018 have been compiled into a playlist below available to stream on Spotify and Apple Music, which added Gold/Platinum Canada to its roster of curators earlier in 2018. A collection of plaque presentation photos can be viewed on our Facebook page, or on our Playback 2018 microsite. Ahead of his 80th birthday, iconic Canadian singer-songwriter Gordon Lightfoot was presented with a Gold plaque for his 2000 DVD Live In Reno. 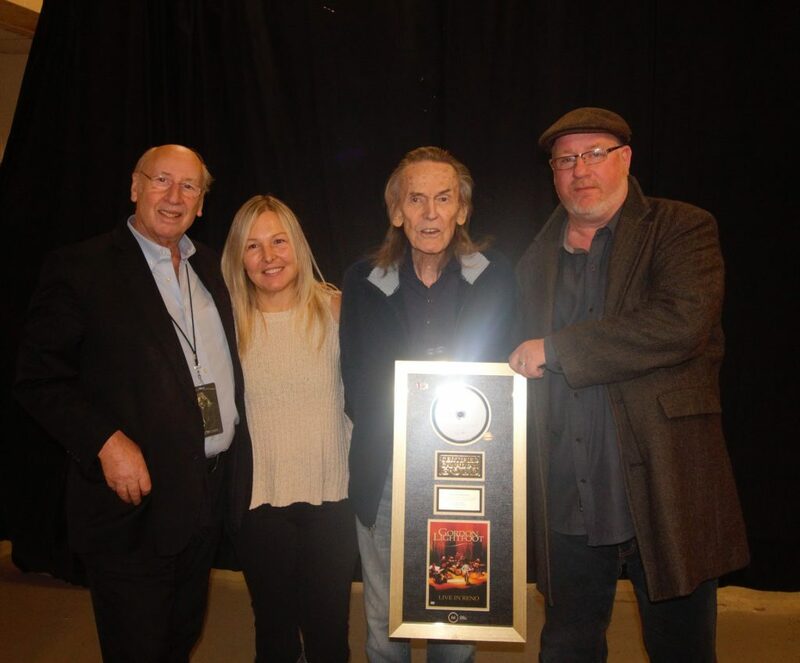 The plaque was presented at Lightfoot’s concert at the FirstOntario Centre in Hamilton, ON. Linus Entertainment’s Geoff Kulawick, who distributed the concert video, presented Lightfoot with the award, along with Brooke Kulawick and Bernie Fiedler. Watch Gordon Lightfoot’s performance of his hit “The Wreck of the Edmund Fitzgerald” from the Gold-certified DVD below.